Depending on how far into credit card debt you are, or how dependent you are on them, chances are you will need to take a serious look at your budget. I have a detailed guide on how to correct budgeting troubles that will be helpful if you have been struggling for a while. Otherwise, take a peek at these few tips on how to start dissecting your budget. This is a pretty simple, straight forward step at starting to dissect your budget. You know how much you make and how much you need to pay all of your major bills. But, if you are struggling to pay bills each month and are heavily dependent on credit cards, chances are you are spending excess money beyond just the necessities. If you want to seriously stop using credit cards, your budget is going to need a little more work. After dissecting your budget and subtracting all of your major monthly bills it’s time to take a look at your excess spending and where you might be wasting money. Depending on who you are, these expenses are going to look different, but these are some ideas to get you started. Take the time to write down each unnecessary purchase and be totally honest with yourself about what is a necessity and what is not. Write down each purchase and the total amount of money spent then add up your total amount spent on unnecessary purchases. If you are using credit cards to purchase things that are non-necessities, you’re in trouble. Maybe you are spending all your money on things that are non-necessities which is causing you to pay for your necessities with credit cards…you’re in even bigger trouble. 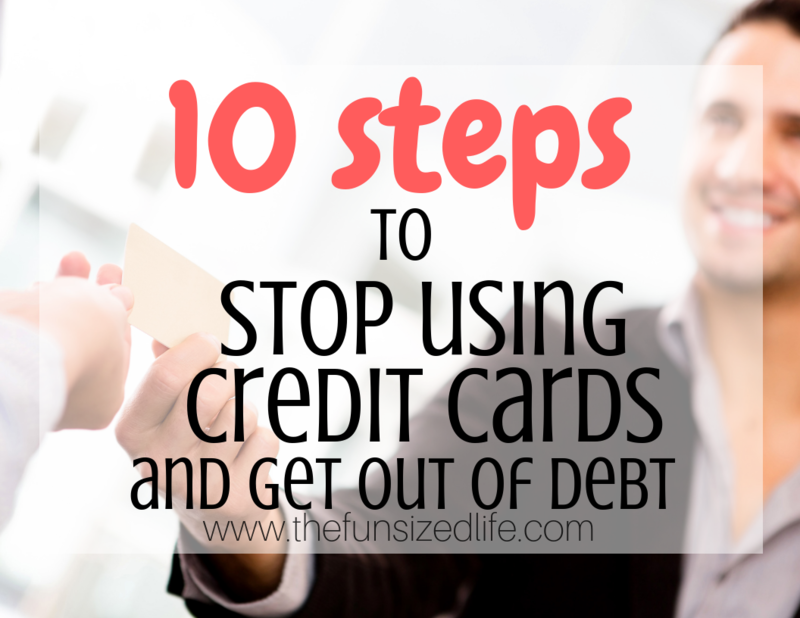 If you seriously want to stop using credit cards, then most of the times drastic measures need to be taken to prevent you from falling back into the credit card traps. Find ways to reduce your monthly bills and quit excess spending. A great way to get started reducing monthly bills is by signing up for Trim. Trim will look at your monthly spending habits and instantly find you different ways to save! As soon as we signed up, Trim notified us that we could be saving money on our internet bill each month! Now that you have dug deeper into your problem spending, you should be able to see pretty clearly how much money you have been wasting each month. Take this newly found money and choose to put it into a savings account instead of wasting it on unnecessary spending. Your ultimate goal should be to build up an emergency savings of $1,000. Doing this will help prevent you from using your credit cards to bail you out of tough situations. If at any time you have to use money from your emergency fund, make sure you take the steps to rebuild your fund as soon as possible. Building an emergency fund is the number one step in Dave Ramsey’s 7 baby steps to help you live a debt free life and build wealth. It’s that important. You can easily apply online for a loan with an interest rate of around 12%. Once you have taken out a loan, use it to pay off all of your high-interest rate credit cards immediately. Doing this may not lower your monthly payments, but it will prevent you from wasting even more money on interest which means you may be able to pay your debt off sooner. Now that you have a sturdy budget, an emergency fund in place, and potentially lower interest rates on your debt, you can get a strategy in place to begin digging yourself out of debt. This is the biggest step you can take to help you stop using credit cards. The less money you owe to creditors, the more financial freedom you will find. My best recommendation to start paying off debt is to use the Debt Snowball. We used this method and were able to pay off over $6,000 in just 6 months. See how we did it. This is the toughest step for some people, but it is the biggest step in the right direction. Once you have your safety nets built up and smart debt payoff strategies in place, it’s time to ditch the dependence on credit cards. Not only do I recommend cutting them up, but forget the numbers, cancel them…do whatever you have to to completely eliminate the temptation. I spent most of my adult life being afraid of using cash on purchases. Now I see how beneficial it can be. After we do our monthly budget, I make a trip to the bank and take out all the money we will be using for fun money, groceries and any other expenses we feel we need that month. The only money left in our bank account is to be used for gas. This has been so helpful when going to the grocery store because I am now more aware of how much money I am spending. I slow down and think through all of my purchases better. Just like you budget your bills, your gas, and groceries, it’s a good idea to plan ahead and create sinking funds for things like Christmas, new car tires, back to school and other major moments in life that you know will be coming. Setting up a fund for these things will stop you from being totally blindsided by unexpected costs. Planning for these will prevent credit card use and/or dipping into your emergency fund. Chances are there has been a certain area where you struggle with your credit card use. For me, it’s shopping. I love(d) shopping. Now I avoid malls like the plague because I know how easily I get sucked into over-spending. Whatever it is that causes you to credit card out of control, start practicing self-restraint by avoiding places that may make you whip out the plastic. Making major lifestyle changes are never easy, but this one will be worth it! Taking the time to plan and strategize will only benefit you in the long run. You’ve got this. Just keep going.